Love your yolks bright orange? Egg producers know that -- and they make sure that egg yolks are colored just the way you like 'em. To hear such crows of superiority, you’d think that hipster hen keepers invented brightly-colored yolks. But consumers have shown a preference for strikingly colored yolk for at least a century, and egg producers have been catering to this trend for just as long. In a 1915 paper in the Journal of Biological Chemistry, Dr. Leroy Palmer identified the chemical culprits behind yolk coloring. “The consumer demands highly colored yolks in ‘fancy’ eggs throughout the year, and the eggs with pale colored yolks, so frequently found on the market during the winter months, are the object of much complaint, particularly in cities,” Palmer wrote. He found that yolk color is determined by a class of carotenoids called xanthophylls. Nearly 100 years later, this conclusion is still widely accepted. Carotenoids are pigment molecules produced primarily by plants, and are only available to animals via diet. They include precursors to vitamin A, and many have been shown to have antioxidant capabilities. Historically, pale egg yolks were often taken as a sign of sick or malnourished hens. But it’s not always the case. In many African countries, white corn is typically a part of chicken feed. White corn (or maize) is low in carotenoids and hens that eat it can produce eggs with yolks so pale they’re almost off-white, despite the chickens being well nourished and healthy. Research by DSM Nutritional Products shows that German consumers prefer darker orange yolks, while egg eaters in the U.K. prefer something a bit paler. In Italy, eggs are named according to the color of their yolks, with yellows being referred to as giallo dell’uovo, and the orange yolked eggs called rosso d’uovo. 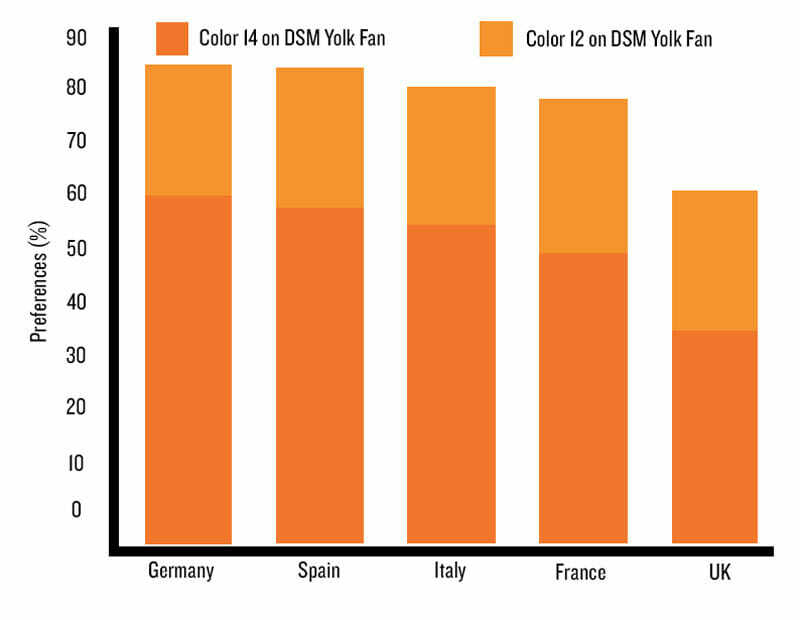 There is an egg yolk color identifier, called the DSM yolk color fan. 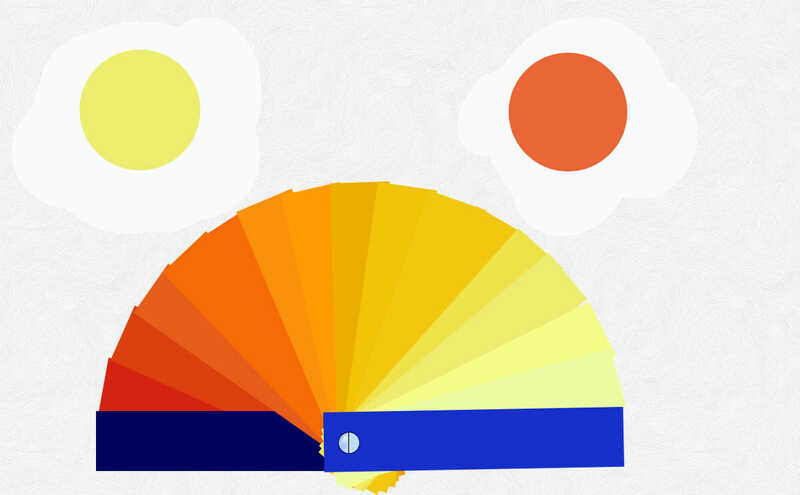 Formerly known as the Roche Yolk Color Fan, it looks similar to the paint color fans from the hardware store, and contains 15 shades along the yellow-to-orange spectrum, and is the industry standard for assessing and comparing yolk color. After witnessing Matt Romero’s red chile eggs, I went straight home and began feeding red chile powder to my hens. They weren’t too into it, maybe because it’s tough to peck at powder, so I made them a mix of chile powder and fish sauce, which they eagerly devoured. After about a week of this regimen, my yellow yolks turned red. I had saved some of the “before” eggs, from prior to their chile diet. After the yolks turned red, my wife and I did several blind taste tests between the red chile eggs and the paler “before” eggs. The blind tests confirmed what I had wanted to believe was true: the eggs with the red yolks tasted better, with a decidedly creamier, fuller flavor. But my excitement was short-lived, as I realized that perhaps the addition of daily fish sauce to the hens’ diet could have something to do with the differences in flavor. Although I had succeeded in making my eggs taste better, I hadn’t proven a connection between flavor and yolk color. But at least they still looked awesome. And you can be sure I bragged about that color at the coffee shop. The egg industry uses the yolk color fan to zero in on and maintain the yolk color it desires for its eggs. Xanthophyll extracts like lutein, Î²-cryptoxanthin, zeaxanthin and canthaxanthin, derived from natural sources, are routinely used to micromanage yolk color. Such sources include marigold leaves, yellow maize, green feed like alfalfa, orange peels, algae, carrots, and annatto seeds. Synthetic pigments can be more powerful than naturally derived pigments, but consumer preferences for natural ingredients in feeds have kept the industry focused on natural sources, or liquid extracts thereof. The manipulation of yolk color isn’t just something practiced by large-scale producers. At a farmers market in Santa Fe, vendor Matt Romero is frying purple Peruvian potato samples. When his friend stops by to say “hi,” Romero opens one of the egg cartons he has for sale, and cracks a pair into the pan. The yolks are a spectacular shade of dark, sunset-red. Because of how easy it is to manipulate egg yolk color, a recent NPR story concluded that judging eggs by their yolks’ color “won’t tell you anything” about their nutrient content. This might be an oversimplification. Many of the xanthophylls added to enhance yolk color are actually good for you, such as Î²-cryptoxanthin, which is both a precursor to vitamin A and an antioxidant. It also plays an important role in bone health, among other benefits. There is talk about introducing GMO corn with extra Î²-cryptoxanthin to some African nations, as it would be good for the hens, and some of the extra Î²-cryptoxanthin would make it into the yolks of eggs of chickens that eat it. Lutein, another yolk-brightening xanthophyll, also has antioxidant qualities as well, and it accumulates in the retina, where it is thought to protect against age-related sight degeneration. Three eggs of normal-colored yolks per day will give a little less than your daily recommended dose of 80 micrograms of Î²-cryptoxanthin, and we can assume that if the hens that laid those eggs were pumped full of Î²-cryptoxanthin, that dose would likely grow. Before you get too excited about the nutritional possibilities of richly-colored yolks, consider that two servings of butternut squash per month will give you more than your monthly dose. By weight, pumpkins have about 717 times more Î²-cryptoxanthin than the average-yolked egg. One cup of kale, meanwhile, has 79 times the lutein than two eggs. So, despite containing nutrients, richly pigmented yolks are not guaranteed to be significantly healthier. But if you know anything at all about where the eggs in question came from, the color of the yolk can in fact be a useful clue into its nutrient content, for reasons beyond how much xanthophyll they contain. Hens that forage on rich pasture would presumably eat a lot of bugs and green plants, a diet full of carotenoids, including xanthophylls. Bugs and plants make for a healthy diet, regardless of yolk color. Hens that are healthy, and have had their fill of vitamins, will be in a position to stash the leftover nutrients in their eggs, while hens that are nutrient-deprived will not. So bright yolks really could be a sign of healthier eggs, especially if the farmer isn’t intentionally pigmenting them. And at the farmers market, you could always ask. By the same token, if a carton of eggs billed as “free-range” contains pale yolks, that could mean that the eggs were produced in a way that barely satisfies the minimum requirement to merit the free-range label. That is, the chickens were given access to a postage stamp-sized patch of dirt next to their massive barn – a barren piece of earth from which all living, edible materials have long since been devoured. A patch of dirt they may not even use. In this case, yolk color can be used to help determine if a brand of free-range eggs is worth the extra money. And if you bring home the cheapest eggs at the supermarket, only to discover yolks blaring like the sun from your pan, you’ll know those yolks are the equivalent of a sprayed-on tan.